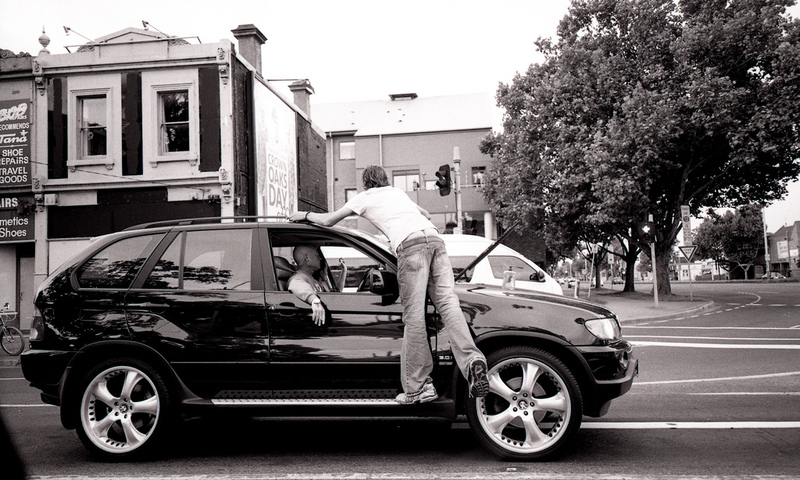 Simon Stephenson got me hooked on the Ricoh GR1V – a little surprise of a camera. You can now read my review of the wonderful newish digital version of the Ricoh GR here! Ricoh have a fair bit of cred in the compact camera space. The GR series of 35mm film cameras have continued into the digital age and the most recent iteration is a ripping camera. But that is a review for another day! Ricoh GR1 : The original – 28mm F2.8 lens. 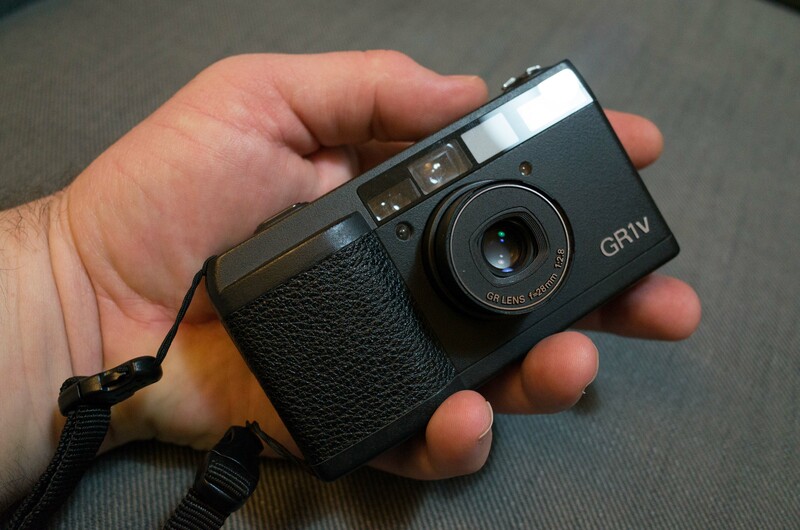 Ricoh GR1s : Pretty much the same as the GR1. Ricoh GR1V : Same – but with manual ISO, manual focus, bracketing. I have only tried the GR1V which I am reviewing here. The camera is incredibly compact – it can truly live comfortably in a pocket. Unlike the Nikon 35Ti which I have reviewed preivously, it is quite narrow front to back. It is almost half as thick as the Nikon. The lens retracts nicely into the body to minimise the chances of damage. 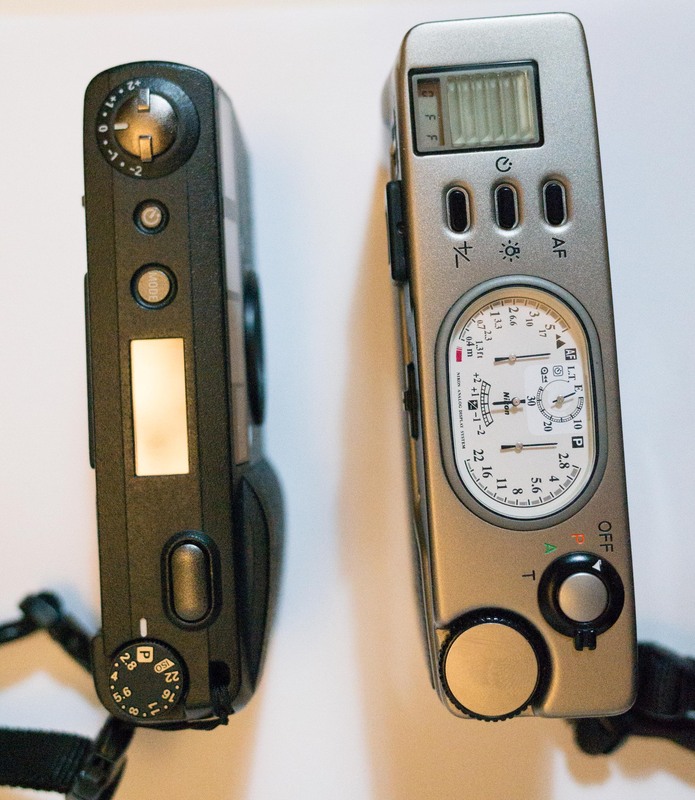 The Nikon 35Ti vs Ricoh GR1v. The Ricoh is more “pocketable”. The Ricoh must have designed by a street photographer. The focus is pretty quick for a compact film camera. It has a centre spot which changes from a rectangle to a square as focus is achieved. The viewfinder has useful information which is laid out without distracting the user. The different shot modes are actually reasonably useful. The camera automatically selects the right mode and makes the adjustments where required, eg: turning off the flash if in Macro Mode. Whilst these modes are not that useful on a decent SLR or similar camera, they are specifically designed on a compact to overcome the limitations of machine, from what I have experienced. The lines at the top are the parallax compensation marks – which pop up when needed. The viewfinder is much less cluttered than the 35Ti. Displaying the shutter speed in the viewfinder is essential for street photography – I try not to shoot anything that is moving slower than 1/125. Platinum Lounge at Melbourne Airport. The flash has a specific, easy to use switch. The choices are No Flash, Auto Flash, and Always Flash. The camera has been well considered from an ergonomic perspective. The switch is simple, and in the right spot on the back of the camera for quick access. The camera also shows under and overexposure in the viewfinder window by flashing either the 30 or 500. I am pretty sure the flash fired for this one. Kodak Trix 400. The shutter is good for 2 seconds to 1/500. 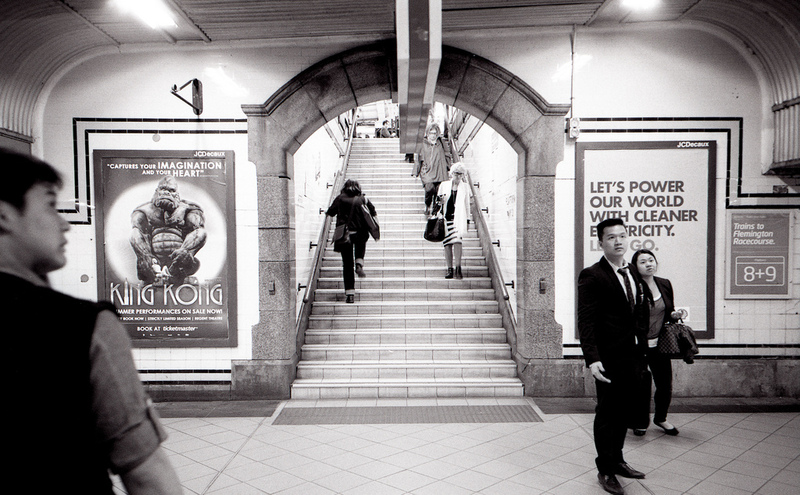 Still a bit slow for my liking, but not unusual for a compact film camera. It will shoot in P mode where the camera selects the aperture and shutter speed. This is usually my preferred mode for on the go shooting. 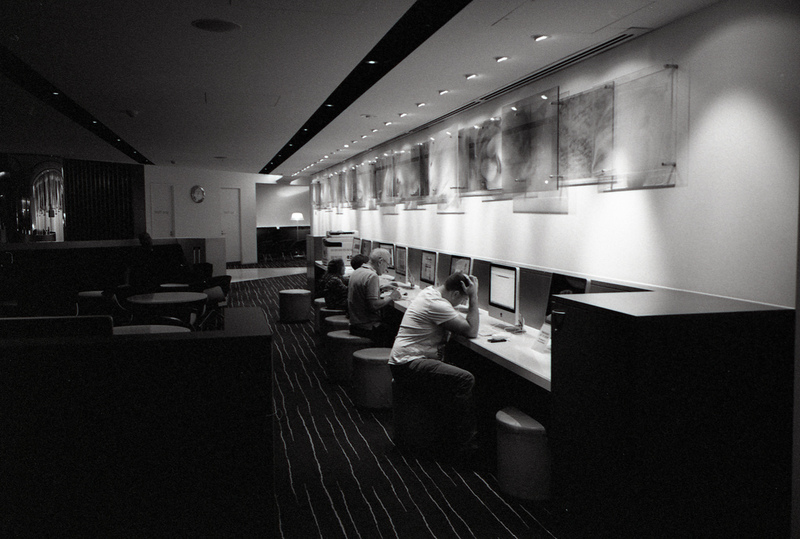 I find it difficult to change aperture on the fly on compact film cameras. The dial on the Ricoh is pretty well designed, but I still don’t often use it. Without an indicator in the viewfinder for aperture, it is just a bit hard. Everything is easy to use on the Ricoh. The exposure compensation dial is on the top surface and clearly marked. The Command dial has easy to read F stops and P mode marker. Quick focus for street photography. The Ricoh GR1v has a manual ISO setting function for pushing film. It is pretty easy to set, and very useful for those darker, overcast days, or inside buildings etc. One of the things that fascinates a lot of photographers is the snap focus mode. Once set, the camera has a fixed focus point of approx. 2 metres. Perfect distance for quickie street photos where you don’t want to have wait for the camera to focus. There are also separate manual focus modes which enables the user to set the focus at 1m, 2m, 3m, 5m or infinity. I don’t really use either snap or manual focus mode. The camera focuses quickly enough in most situations that I find myself in. Everything about the camera has been designed with the user in mind. The right hand side of the camera has a comfortable grip, making it easy to handle. All the dials and switches are clearly marked, click into place properly, and are intuitive for an experienced photographer. The only downside is the LCD display which tends to eventually fail, from what I hear, along with the film winding motor. If you like super wide angles for street photography, then this is a great camera. Very compact, and very light. Much lighter than the Nikon 35Ti. The main issues with this camera is the LCD potentially bleeding, the foam inside the film compartment, and the motors. The GR1V is quite sought after and a decent example is going to run you at least $AU500 – with no guarantees that the motor will last more than a couple of rolls! A lovely camera but a relatively high risk purchase, I suppose. The GR1v commenced production in 2001, but I can’t find a reference as to when Ricoh stopped production. not as many features, but same lens and body. Never actually even knew they existed until you flagged it! Will check them out… Seems a much more affordable option.